Morning meet with our representative and drive to the hill station of Chikmagalur. Situated in the southern state of Karnataka, Chikmagalur literally means "The town of the younger daughter" in the native Kannada language. The town is said to have been given as a dowry to the younger daughter of Rukmangada, the legendary chief of Sakrepatna and hence the name. 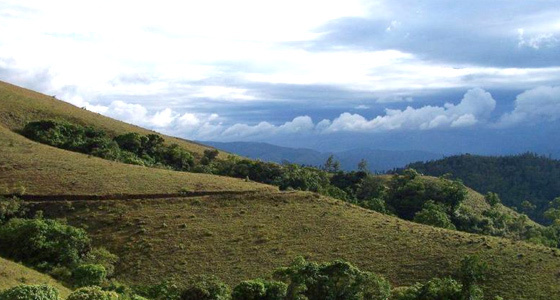 Chikmagalur was the first place that coffee was first cultivated in India. Rivers like Tunga and Bhadra have their sources in the mountains here which are part of the Western Ghats. On the way to Chikmagalur we will visit the ruins of Belur in Hassan district. Belur is famous for its magnificent Hoysala Temple Complex. The Chennakesava Temple here is the major attraction, built by Hoysala Vishnuvardhana, to commemorate his victory over the Cholas. The facade of the temple is filled with intricate sculptures with no portion left blank. It is the only Hoysala Temple still in active worship. Further continue drive to Chikmagalur . Upon arrival check into the resort. Rest of the day at leisure. Overnight stay at resort. Today after breakfast we will visit the Mullayangiri for its breathtaking view. Mullayanagiri is part of the Baba Budangiri Hill Ranges here. It stands 1930 meters tall and is the tallest peak in Karnataka. Its height is famous mostly for watching sunsets from. It is 16 km from Chikmagalur town. Driving to Mullayanagiri is worth taking a risk. On the way is Sitalayanagiri where the water in the Shiva temple neither increases nor decreases. The road to Mullayanagiri is very narrow with a views from steep cliffs. Driving to the peak is not possible and includes a trek up the hill from the halfway point. There is a small temple on top of the hill. From the topmost point of the hill the Arabian sea is visible on clear days. The small hillock in the temple compound is the highest point in Karnataka. The narrow road to the temple makes two way traffic impossible. It is a great trekking spot in Karnataka. Later return to the resort for lunch. After lunch it's time to relax and enjoy the calmness of nature. Overnight stay at hotel. Optional : One may opt for its enchanting waterfalls like Kallathigiri Falls and Hebbe Falls while staying in Chikmagalur. Kallathigiri Falls, also known as Kalahasti falls is a fall that cascades down from the top of the Chandra Drona hill from a height of 122 meters amidst fascinating scenery. There is an old Veerabhadra temple dedicated to Lord Shiva, constructed in a gap between rocks. This temple can be approached after crossing the waterfall. Hebbe Falls, in this beautiful waterfall the water streams down from a height of 168 meters in two stages to form Dodda Hebbe (Big Falls) and Chikka Hebbe (Small Falls). After a sumptuous breakfast leave for Bangalore.